Happy New Year from the Remarkable Group! I hope your holiday season is treating you well and you are ready to begin 2018. It’s going to be a Remarkable one. We definitely hope it is for you too! There is so much great advice out there today about goal setting, particularly at this time of year. Every year I have this habit of spending time getting the ‘right’ diary. Sometimes I get one and then I see one I think is better - Is it the right colour and right texture and then have to make a decision about whether I go fully digital or stay with writing things down. (It suits me to write things down but I do have to get with the times) Every year I create this dilemma for myself (and I secretly love it!) I’ve stopped beating myself up about it and see it as my way of settling into the year. I love talking about setting goals and thinking into the year ahead but find that it’s very easy to overwhelm myself with too many choices or thinking too big. I can also try and get too clever with planning but have found the simpler the better when it comes to getting things done. I shared the following simple strategies (and more) that are easy to incorporate into your year in the Remarkable Women Radio episode that aired on January 2 at 3.15 on Planetfm 104.6fm. 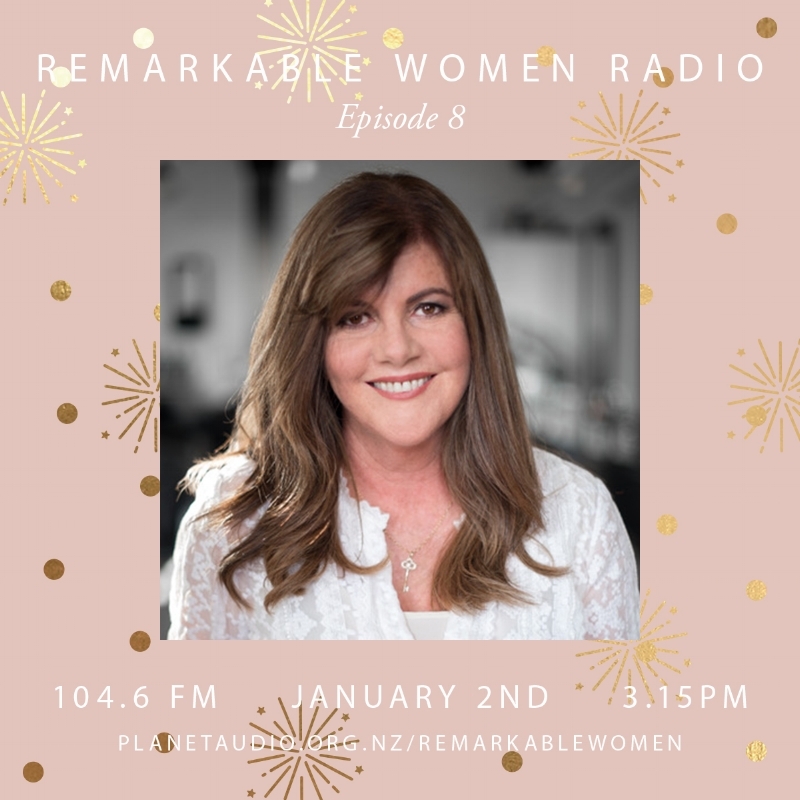 Listen in now by clicking this link here: http://www.planetaudio.org.nz/listen/remarkable-women/remarkable-women/332384. 1. A Remarkable Method of planning for your big goal using a holiday analogy. I have a theory that we can spend more time planning a 2 or 3-week holiday than we do our goals for our business or life so try this method for planning a big goal this year. Imagine you are about to go to Europe and you specifically want to go to Italy in summer. (Change Italy for your favourite country) You actually start to think about Italy, you might watch a movie about Italy like “Under the Tuscan Sun” starring Diane Lane or the Rome portion of “Eat Pray Love.” You imagine what it would be like to immerse yourself in a new country, discovering beautiful scenery and seeing famous buildings. You imagine finding the ideal open-air café so you can watch the world go by. You know you want to find the best pasta or you wonder how many flavours of gelato will you need to try to find your favourite one. You get the idea. When we plan a holiday we are excited, we get visual and we engage our imagination. We don’t second-guess things and we are way more decisive. We literally put ourselves into the picture we want. So with that in mind here is the holiday planning analogy in 5 simple steps that I mention on my radio show. 1. See it in your mind’s eye. We get brochures, we visit websites, we make a pinterest board. You may even make a new screen saver to remind you of what you are looking for. You begin to think about what you want. You research and talk to people and figure out how much it’s going to cost. What airline goes where you want to go? Do you have a stopover? Where do we want to go in Italy and when? Are we going to wing it or are we going to plan a lot of the details. What are our must see’s while over there? The detail is being thought about and being worked out. It becomes a big focus and sometimes all you can think about. Despite the detail it’s still exciting because you have a firm picture in your mind of where you are aiming. Once all the detail has been mapped out and the idea is taking shape, we have to take steps to actually help it come to fruition. E.g. get time off work, get someone to look after pets etc. We put even more detail into the plan. We think through all the necessary steps to make sure we can go. We make room in our schedules. We check what else is going to conflict with those dates. It’s scary and exciting but… we have made the decision to go! We begin to tell everyone and begin the countdown. We may literally take a deep breath, put a hand over our eyes as we hand over our credit card details and push enter on the payment. We have committed to our idea. Then begins the packing, the double - checking and the double- double-checking. People then tell us their good times when they’ve been travelling (and their horror stories) but we don’t waiver because we have committed ourselves. People know it’s happening – so there is accountability. You talk about it and don’t doubt that you are going to do it. 5. You just do it. The date has arrived. You have everything you need. It’s been a major focus for months now and all you have thought about particularly as the date got closer. You have to be at the airport NOW so you have done all you can to make sure you will be on time. You’ve been running through the checklist of ticket, passport, money, keys etc. You are not carrying too much baggage. In fact you may be travelling lighter than you normally would, as you want to do some shopping while you are there. You put your passport details into the check in machine and out comes your boarding pass. You are on your way. You step out with some (actually most) of the unknown unanswered but you know you will figure it out as you go. As Nike says, you just do it. You have literally no idea what it’s actually going to be like but you are sitting on the plane and winging your way to Europe. What if you used that same analogy to your big (or small) goals for 2018? 2. Plan it – Research to find out the facts and gain clarity on what you want to do. 3. Decide and Schedule it. Decision is made! Set everything in motion. 5. You do it. You may not be ready but the dates here and you just go do it. 2. A glass of champagne anyone? I often ask myself when I am goal setting to fast forward to New Years Eve of the year we are in – in this case that will be December 31 2018. I close my eyes and I imagine I am I’m sitting outside looking up at the stars on New Year’s Eve holding a glass of champagne in my hand. I imagine it’s already the end of the year just for a few moments. And I ask this question: As I look back over my year (remember you are thinking a year ahead) what are the 3 things I have put in place this year that has made the biggest difference for me this year. If you are patient you will get an answer so listen for it quietly. You may get a picture, a sense or a knowing of at least one thing. Write it down. It’s a great way to help you focus. Then get a sense of how you can instigate that ‘pearl of wisdom or download’ in your life and business this year. I first heard the following four questions from Jayne Warrilow a few years ago. When I thought about these questions in depth I got some interesting answers. I hope they reveal something to you too! I would grab a notebook and record your answers. 1. What would you be able to activate in the future if you knew you couldn’t fail? 2. What is the next step you are avoiding? 3. What dream are you discounting as impossible? 4. What payoff are you getting for remaining stuck at this point of your expansion? 1. What could you be doing? 2. What are you not doing? 3. How do you shortchange yourself? 4. Why do you persist in doing the things that keep you stuck? Listen here http://www.planetaudio.org.nz/listen/remarkable-women/remarkable-women/332384 to the Remarkable Women Radio Show. These are all simple easy strategies that I hope will get you moving in the direction you really want to go this year. http://planetaudio.org.nz/remarkable-women at 3.15pm every Tuesday or via www.remarkablegroup.co.nz/remarkable-women for previous episodes.